I love the Drive-In. I was reminded of that this past week as a local mall here in Victoria hosted the first night of a three evening revival of the Drive-In experience. With a good chunk of parking lot to utilize, a BC outdoor film company set up a massive inflatable screen upon which they projected the American classic GREASE. The wife loves this film but I usually loathe 99% of all musicals - all it took was the Drive-In experience to turn me into a fan. Sitting there waiting for the sun to set in a convertible with the top down, munching on popcorn and admiring the Chevy Bel-Air parked a few feet away, childhood memories were reawakened. Around 25 years ago, my sister and I would climb into the family sedan in our pj's, squirm for twenty minutes as we headed out of town. When we finally arrived and found the best spot to view the show, usually a double feature, my sister and I would impatiently wait for it to get dark . Inevitably, mom and dad fell asleep halfway through the second film and we would have to rouse them as the headlights of exiting cars streamed by. Sadly, the Drive-In theatre has completely vanished from the lower half of Vancouver Island and is a rare sight throughout much of Canada today. I understand there is a revival of Drive-Ins across North America but damned if I don't see it happening around these parts. 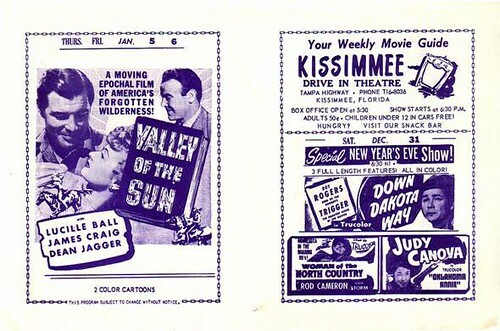 Which brings me to today's selection - a great handout from a Drive-In out of Kissimmee, Florida. I particularly love the notation that CHILDREN UNDER 12 IN CARS FREE! - you goddamn freeloaders on your bikes, scram!! I find it somewhat odd that GORILLA AT LARGE is playing in the middle of the week and the flyer seems to imply that it is a "Family Nights" feature. 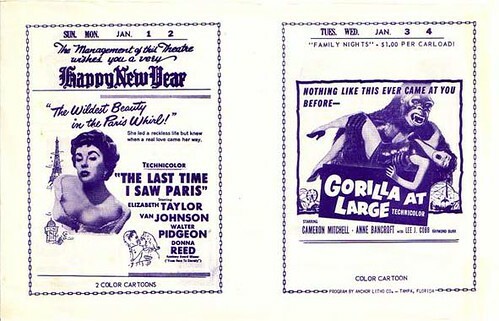 Nothing like a murderous ape and a slutty Anne Bancroft to keep the kids entertained! I couldn't help poking around YouTube for a few other clips on Drive-Ins to remind myself of this abandoned cornerstone of family entertainment culture.